The FR-A770 inverters – high-performance devices with an operating voltage of 690 volts – are Mitsubishi Electric’s latest additions to the FR-A700 series. The FR-A770 inverters are based on the successful FR-A740-EC models and are suited for use in harsh environments. The FR-A770 frequency inverters combine innovative functions with reliable technology, ensuring maximum performance, efficiency and flexibility. Two models with motor-rated capacities of 355 and 560kW with high overload capability of 150 percent for 60 sec are currently available. They are suited for demanding drive tasks requiring high speed and torque quality such as, for example, in the shipping and offshore industry and water/waste water industry. Possible areas of application include cranes and lifting units, conveyor belt systems, extruders and centrifuges, printing presses, winders and mining or even ski lifts and cable cars. All FR-A700 series inverters are equipped with Real Sensorless Vector control for speed and torque control in open loop, as well as for positioning in closed loop to ensure optimum control quality. The FR-A700 series can be used in conjunction with servo drives within a motion system. Plug-and-play integration in positioning systems can be realised via SSCNET III. The inverters can also be utilised as leading axis drives. 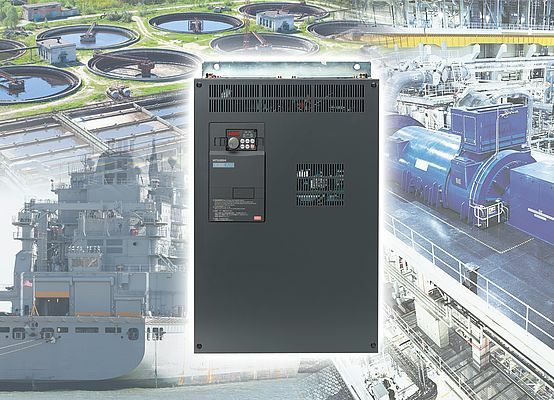 The integrated PLC functionality allows direct access to all the drive parameters and it can take over plant management as an autonomous control and monitoring unit if required. The frequency inverters are equipped with a USB, RS485 and Modbus-RTU interface as standard and also comply with international network standards such as CC-Link, CC-Link IE Field, Profibus DP, Profinet, EtherNet IP/ DeviceNet and LonWorks.